War and Priest: "Keeping the Faith" and "U-571"
If you've seen the trailer for Keeping the Faith - a slapsticky montage featuring the sight of Edward Norton, as a priest, setting his clerical robe on fire (which he extinguishes by leaping into holy water), and Ben Stiller, as a rabbi, punching a woman in the stomach - you might be shocked at the sweetness and earnestness of the movie itself. The film's trailer is one of the biggest pieces of false advertising in recent movies. Those "screwball" moments are in the film, all right, but they're tossed off as quick, forgettable chuckles in a movie that's interested in more than that - and a movie that's much funnier than its previews would lead you to believe. 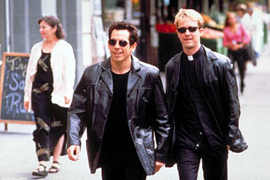 Keeping the Faith, directed by Norton himself with a first-rate screenplay by Stuart Blumberg, is a joy pretty much from start to finish, a film that transcends the gimmickry of its set-up with energy, good humor, and just a dash of seriousness. At the beginning, Norton's priest, Brian, enters a New York bar and dives into a sloshed retelling of his woes involving his best friend Jake (Stiller), and Anna (Jenna Elfman) - the woman they both love - to a bartender (the wonderfully incredulous Brian George). "A priest and a rabbi?" the bartender asks. "Haven't I heard this one?" That small, perfectly appropriate joke is the key to the movie's success. Establishing the movie's high-concert idea - A priest and a rabbi in love with the same woman! Can you stand it?! - as fairly ridiculous gives the film breathing room; the filmmakers and performers are then free to take the idea, and the characters, to surprising depths. Anna, who's Brian's and Jake's childhood pal, shows up for a job in New York and has the men falling for her, but their professions have made the crush rather hard to take. Brian, obviously, has his vow of celibacy to contend with, but Jake has problems of his own - his congregation expects him to marry within his faith, and Anna is as WASP-ish as can be. As a performer, Norton is just about perfect, too. The joy Brian takes in his religious calling is palpable, as is his love for Anna and Jake, and when his faith is tested, you feel exactly how and why it's tearing him up. Stiller is a little too facile a performer to bring out the full range of emotions Jake should display, but he's a terrifically confident funnyman, and his scenes with Norton have an alert rhythm. Their banter is sensational, particularly when Brian does a Rain Man riff, and they have the shared humor that best friends often have. The teamwork between Norton and Stiller is just about flawless; you feel that they've been friends since childhood, which makes their eventual squabbles surprisingly poignant. Keeping the Faith runs a bit long - it could have used a little trimming, especially of the scenes with Jake's superiors wondering what they're going to do with this live-wire rabbi - but it's as enjoyable a romantic comedy as one could hope for, with terrific dialogue, marvelous leads, and nifty character turns by the likes of Anne Bancroft and Milos Forman (who directed Norton in The People Vs. Larry Flynt). It has the makings of a sleeper sensation; doesn't let the aggressive (and mostly unfunny) previews put you off. 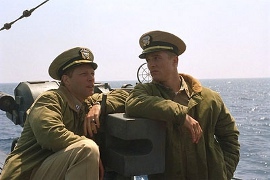 U-571 is about as generic and unmemorable as an action drama can get, but it's been five years since we've had a big, claustrophobia-and-mutiny-on-a-submarine flick (1995's Crimson Tide), so it'll probably be a hit. It also has some magnificent sound effects, whiplash editing, and realistic art direction, so it might be a big hit. But I can't be alone in thinking that it's completely devoid of personality, with characters so interchangeable that, when someone dies, you're never quite sure which one died, and situations so retrograde that you know where it's going way before it gets there. In 1997's crackling Kurt Russell movie Breakdown, director Jonathan Mostow took a familiar genre concept and made it unfailingly entertaining (and, at 93 minutes, lightning-paced). Here, Mostow seems to be relying on the concept to do all the work for him; it feels old-hat, and more than a little dull. Admittedly, the concept itself works: In World War II, an American sub takes over a German sub containing the Enigma machine, which will allow them to break German codes. The problem is, once in German waters with a sub that's barely afloat and a crew that, with one exception, can't read or speak German, how do they get out? Unfortunately, for a film with such a seemingly unsinkable premise (pun intended), U-571 fails to deliver much surprise. This is due, in part, to the colorless cast: Matthew McConaughey, in the lead, wavers between not showing any facial expressions and showing far too many - it's a dreadful performance - and character actors like Bill Paxton, David Keith, and even the great Harvey Keitel seem drained of life. But it's mostly due to the by-the-numbers scripting and clichéd, contrived plotting, and in Mostow being more interested in achieving bitchin' sound effects than telling a story that makes narrative sense. I'd give more specific examples if the whole of U-571 didn't vanish from my mind minutes after seeing it; it may only be April, but the wave of senseless, character-free, ultra-loud summer action flicks appears to be starting already.